The 74F3040 is a high current Line Driver composed of two 4-input NAND Gates It has been designed to deal with the transmission line effects of PC boards which appear when fast edge rates are used.The drive capability of the 74F3040 is 67mA source and 160mA sink with a VCC as low as 4.5V. This guarantees incident wave switching with VOH not less than 2.0V and VOL not more than 0.8V while driving impedances as low as 30W. This is applicable with any combination of outputs using continuous duty.The propagation delay of the part is minimally affected by reflections when terminated only by the TTL inputs of other devices. Performance may be improved by full or partial line termination. This is one package pinout of 74F3040,If you need more pinouts please download 74F3040's pdf datasheet. 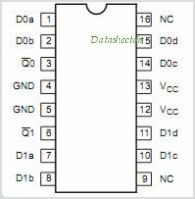 74F3040 circuits will be updated soon..., now you can download the pdf datasheet to check the circuits!